Payday loan rates vary a great deal from state to state and are largely influenced by whatever rules and regulations each state chooses to impose. For states that have little or no regulation, it shouldn’t be surprising that payday loan rates are going to be higher than they are in states with more regulation. If you are interested in getting a quick payday loan you definitely want to ensure that you understand what the rates are in the region you live in, and what governing laws are in place that controls those rates. It’s unlikely that any reputable payday loan company would ever break the law by charging you a rate that is above the legal limits, but when you are dealing with any type of loan you should always have as much information as possible at your disposal. The three states with the highest payday loan rates are Nevada, Idaho, and Utah. It shouldn’t be surprising that of the 7 states that have no legal limits on payday loan rates would include 3 of the highest average interest rates. How high are they exactly? Well, in Nevada the average payday loan rate is 521%. In Idaho it is 582%. In Utah it is 474%. Those are all pretty high numbers, but since payday loan companies are businesses trying to make money you can’t really fault them for taking advantage of the lack of oversight and charging higher interest rates. One of the biggest complaints about payday loans is that they generally take about 1/3 of your paycheck to pay them back. That’s because it is a short term loan with one payment to make, instead of having those payment broken up over a period of months or years. This is the primary reason that quite a few people end up trapped in a cycle where they pay off one loan them immediately get another. The three states with the lowest payday loan rates are Colorado, Oregon, and Maine. It shouldn’t be surprising that these are the states with some of the most heavily regulated loan rates in the country. In Colorado the interest rate is 129%. In Oregon the interest rate is 156%. In Maine the interest rate is 217%. While these interest rates are considerably lower than those in the higher interest rate states, they all still come in right around the legal limit in their state. It’s not as if payday loan lenders chose to charge a lower interest rate in these states, it’s that they had no choice but to do so because of state laws and regulations. If you live in or are visiting Las Vegas, Nevada and need a payday loan, you will have to pay an interest rate of 521% which is the second highest in the country. The good news is that if you are a responsible person, and make sure that you are only using a payday loan as a temporary stop gap until you get your finances in order, that high interest rate shouldn’t be that problem. If however you end up doing something foolish such as being tempted to gamble with the money you get from a payday loan then you are likely going to suffer some nasty financial consequences. So if you are in Las Vegas and are down on your luck, feel free to get a payday loan so long as you are going to use it to cover expenses. If you live in Georgia and want to get a payday loan, it’s going to be quite difficult. The reason for this is the fact that Georgia passed laws which essentially make it impossible for payday loan companies to do business in the state. There are steps you can take to get a loan, such as getting it from an out of the state FDIC insured bank. But the reality is that in most cases the steps you have to take to get a payday loan in Georgia makes it more hassle than it’s worth in most cases. If you live in Texas the payday loan rates tend to vary quite a bit from lender to lender. Generally speaking, you are going to be looking at a payday loan rate in the 350% range. That’s a high interest rate, but it should be noted that it still comes in below the highest interest rates found in states such as Nevada, Idaho, and Utah. 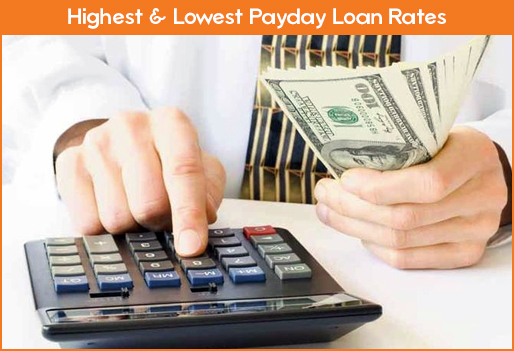 Why Are Payday Loan Rates So Much Higher Than Rates Charged For Traditional Loans? You may be wondering why it is that payday loan rates are so much higher than the rates charged by banks and other traditional lenders. The reason is quite simple, on the part of a lender a payday loan represents a much higher risk of default than a traditional loan does. The reason for this is that payday loans are not loans that rely on a credit check. Without a credit check a lender has no idea what the person borrowing money has in terms of finances. They could be someone with an excellent payment history, but the fact that they are getting a payday loan is usually a pretty good indication that they likely have poor credit. Why Do People Get Payday Loans If The Interest Rates Are Higher? In most cases, someone who gets a payday loan finds themselves in a bind, and they probably have poor credit as well. That means that going to the bank or another type of traditional lender is out of the question since they will likely be turned down. There are times when getting someone to co-sign the loan may help, but then that’s going to involve you asking a friend or family member to put their credit on the line on your behalf. That’s an awkward thing to do, and it can quickly destroy a relationship in the event that you don’t fulfill the terms of your loan and end up defaulting on it. So the main reason that people turn to a payday loan is out of necessity. Everyone hits bumps in the road financially, and if you have bad credit and lack the financial resources necessary to deal with the issue you will likely have few options except a payday loan. While payday loan rates are high, the fact that it is a short term loan also means that you won’t have to deal with that high interest rate for a long time. The key to using payday loans successfully is to realize that they are a short term loan, and then take action to ensure that you can get your finances in order so you won’t have to rely on them on a regular basis.